Draw the electric field lines between two points of the same charge; between two points of opposite charge. 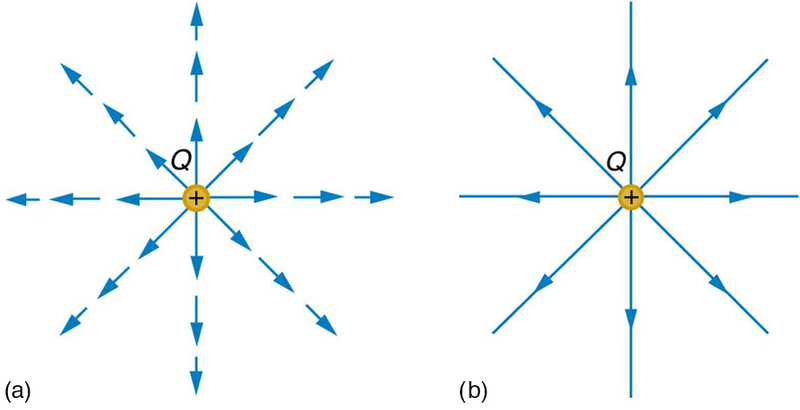 Figure 1 shows two pictorial representations of the same electric field created by a positive point charge . Figure 1 (b) shows the standard representation using continuous lines. 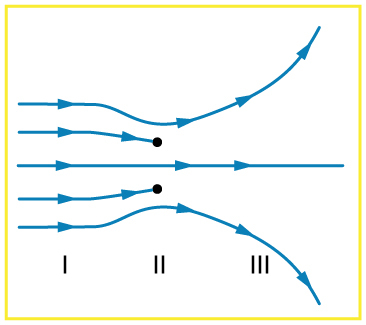 Figure 1 (b) shows numerous individual arrows with each arrow representing the force on a test charge . Field lines are essentially a map of infinitesimal force vectors. Figure 1. Two equivalent representations of the electric field due to a positive charge Q. (a) Arrows representing the electric field’s magnitude and direction. (b) In the standard representation, the arrows are replaced by continuous field lines having the same direction at any point as the electric field. The closeness of the lines is directly related to the strength of the electric field. A test charge placed anywhere will feel a force in the direction of the field line; this force will have a strength proportional to the density of the lines (being greater near the charge, for example). Note that the electric field is defined for a positive test charge , so that the field lines point away from a positive charge and toward a negative charge. (See Figure 2.) The electric field strength is exactly proportional to the number of field lines per unit area, since the magnitude of the electric field for a point charge is and area is proportional to . This pictorial representation, in which field lines represent the direction and their closeness (that is, their areal density or the number of lines crossing a unit area) represents strength, is used for all fields: electrostatic, gravitational, magnetic, and others. Figure 2. 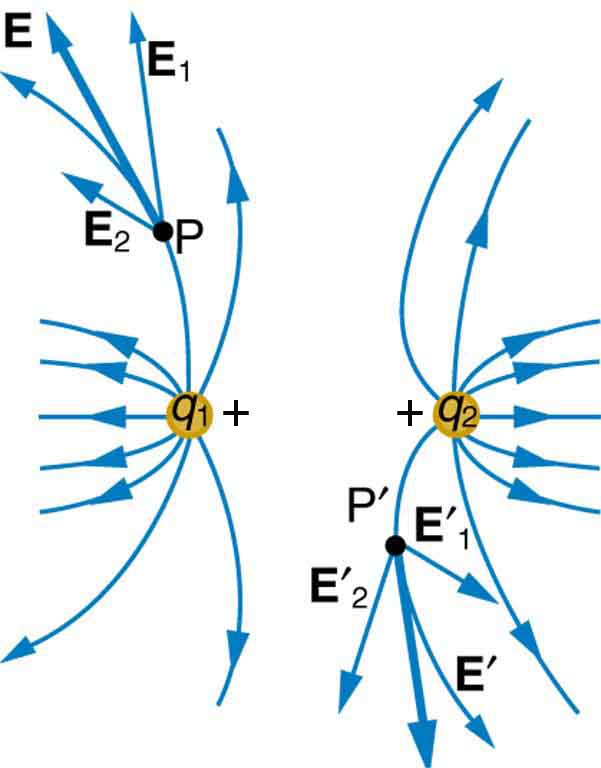 The electric field surrounding three different point charges. (a) A positive charge. (b) A negative charge of equal magnitude. (c) A larger negative charge. In many situations, there are multiple charges. The total electric field created by multiple charges is the vector sum of the individual fields created by each charge. The following example shows how to add electric field vectors. Find the magnitude and direction of the total electric field due to the two point charges, and , at the origin of the coordinate system as shown in Figure 3. Figure 3. The electric fields E1 and E2 at the origin O add to Etot. Since the electric field is a vector (having magnitude and direction), we add electric fields with the same vector techniques used for other types of vectors. We first must find the electric field due to each charge at the point of interest, which is the origin of the coordinate system (O) in this instance. We pretend that there is a positive test charge, , at point O, which allows us to determine the direction of the fields and . Once those fields are found, the total field can be determined using vector addition. In cases where the electric field vectors to be added are not perpendicular, vector components or graphical techniques can be used. The total electric field found in this example is the total electric field at only one point in space. To find the total electric field due to these two charges over an entire region, the same technique must be repeated for each point in the region. This impossibly lengthy task (there are an infinite number of points in space) can be avoided by calculating the total field at representative points and using some of the unifying features noted next. Figure 4 shows how the electric field from two point charges can be drawn by finding the total field at representative points and drawing electric field lines consistent with those points. While the electric fields from multiple charges are more complex than those of single charges, some simple features are easily noticed. For example, the field is weaker between like charges, as shown by the lines being farther apart in that region. (This is because the fields from each charge exert opposing forces on any charge placed between them.) (See Figure 4 and Figure 5(a).) Furthermore, at a great distance from two like charges, the field becomes identical to the field from a single, larger charge. Figure 5(b) shows the electric field of two unlike charges. The field is stronger between the charges. In that region, the fields from each charge are in the same direction, and so their strengths add. The field of two unlike charges is weak at large distances, because the fields of the individual charges are in opposite directions and so their strengths subtract. At very large distances, the field of two unlike charges looks like that of a smaller single charge. Figure 4. Two positive point charges q1 and q2 produce the resultant electric field shown. The field is calculated at representative points and then smooth field lines drawn following the rules outlined in the text. Figure 5. (a) Two negative charges produce the fields shown. It is very similar to the field produced by two positive charges, except that the directions are reversed. The field is clearly weaker between the charges. The individual forces on a test charge in that region are in opposite directions. (b) Two opposite charges produce the field shown, which is stronger in the region between the charges. Field lines must begin on positive charges and terminate on negative charges, or at infinity in the hypothetical case of isolated charges. The number of field lines leaving a positive charge or entering a negative charge is proportional to the magnitude of the charge. The strength of the field is proportional to the closeness of the field lines—more precisely, it is proportional to the number of lines per unit area perpendicular to the lines. 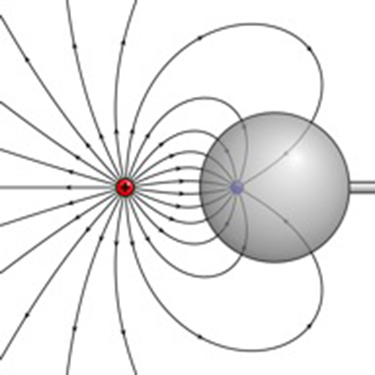 The direction of the electric field is tangent to the field line at any point in space. Field lines can never cross. The last property means that the field is unique at any point. The field line represents the direction of the field; so if they crossed, the field would have two directions at that location (an impossibility if the field is unique). Move point charges around on the playing field and then view the electric field, voltages, equipotential lines, and more. It’s colorful, it’s dynamic, it’s free. 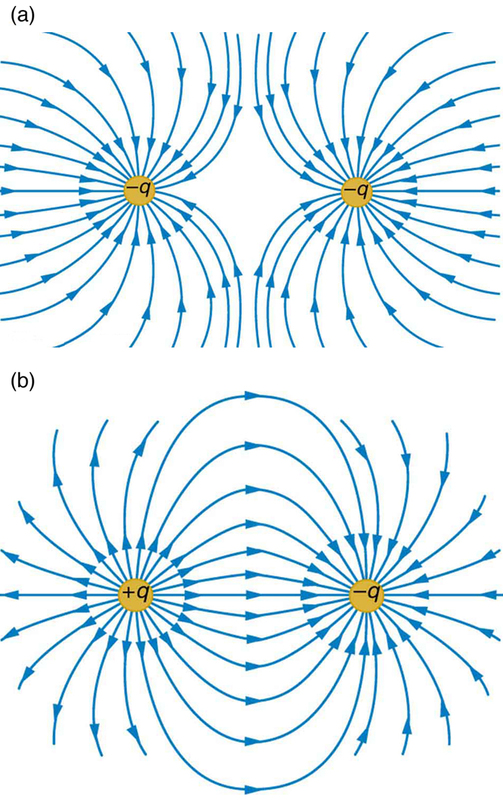 2: Figure 7 shows an electric field extending over three regions, labeled I, II, and III. Answer the following questions. (a) Are there any isolated charges? If so, in what region and what are their signs? (b) Where is the field strongest? (c) Where is it weakest? (d) Where is the field the most uniform? 3: Figure 8 shows the electric field lines near two charges and . What is the ratio of their magnitudes? 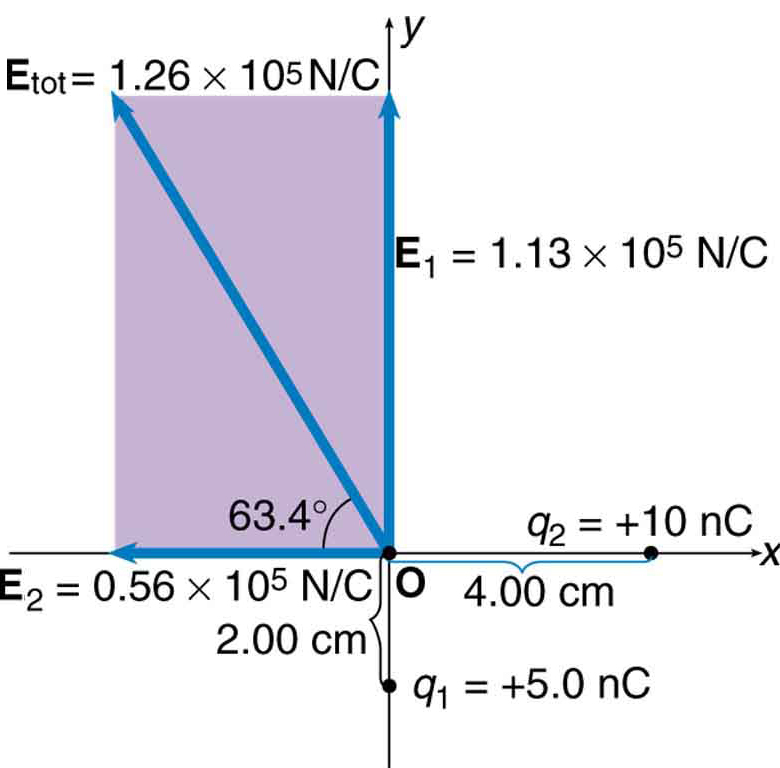 (b) Sketch the electric field lines a long distance from the charges shown in the figure. Figure 8. The electric field near two charges. 4: Sketch the electric field lines in the vicinity of two opposite charges, where the negative charge is three times greater in magnitude than the positive. (See Figure 8 for a similar situation). 18.5 Electric Field Lines: Multiple Charges by OpenStax is licensed under a Creative Commons Attribution 4.0 International License, except where otherwise noted.